HG window cleaner is a super concentrated product which cleans and degreases absolutely streakless but which does not contain ammonia or methylated spirits. No wonder this product is used by professional window cleaners. HG window cleaner exceeds all professional requirements, because the product is pH neutral, so that it will not harm paint, varnish or plastics and is also very gentle for your skin. 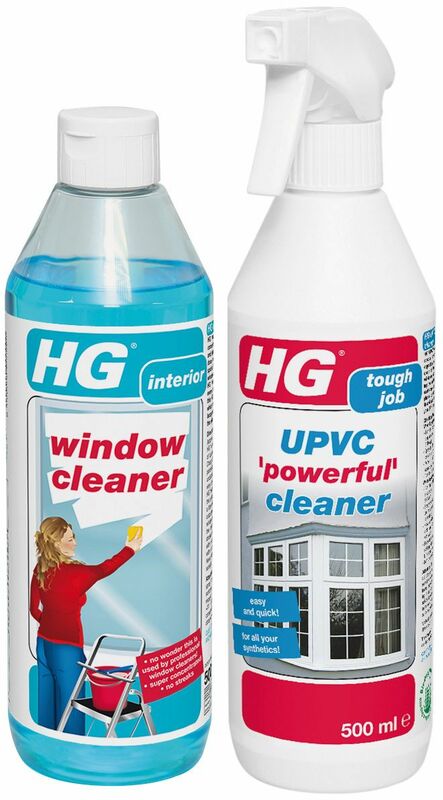 HG window cleaner is very economical to use, because one 500 ml bottle is sufficient for at least 35 window washes. Add 15 ml (2 to 3 teaspoons) of HG window cleaner to half a bucket of lukewarm water. For the best results, wash the window in a circular movement. When drying the window, use a squeegee in overlapping strips and always dry the squeegee with a cloth before applying it to the window for the next stroke. Never wash the windows in direct sunlight. For very dirty spots, HG window cleaner can be used in undiluted form. Apply a small amount of the product to a sponge and dab onto the dirty spot. Leave to soak and then wash off with water. HG UPVC 'powerful' cleaner is a very special, extremely powerful cleaner, especially developed to thoroughly clean all kinds of synthetic frames, windows, doors, etc., without attacking the materials. This unique product easily and quickly removes any atmospheric contamination, nicotine deposits and many other types of dirt, making your UPVC as good as new again.